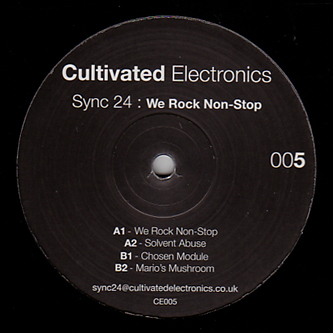 "The EP kicks off with the title track "We Rock Non-Stop". Tight Kickdrums layered with pitched 808 subs set the basis of the track. Chopped up machine and voice samples are then layered with smooth pads and delay's to complete the track. 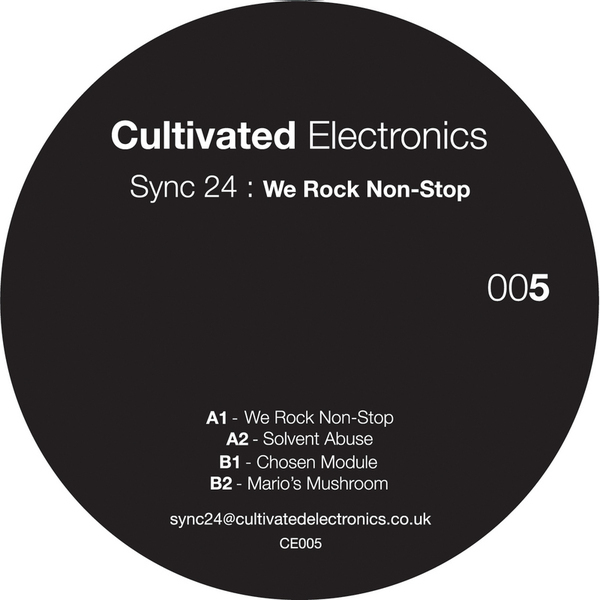 The second track of the EP "Solvent Abuse" see's Sync 24 sticking to his dark roots. Distorted vocals, haunting pads, trippy sequences and dirty bass combined with rolling beats and subs!!! The reverse side of the 12" is slightly deeper, techy affair. "Chosen Module" is a spacious wash of delays and pads mixed with robotic bass and crisp round beats. The final track "Mario's Mushroom" carries on the spaced out trippy theme of the side with more spooky pads, bubbly bass lines and hypnotic rhythms."